Well, the sun may be shining but its freezing outside and its the 1st of May. That’s a big holiday here in France, the start of good times to be had with summer just around the cornier and indeed the weather forecast is promising summery temperatures by the end of the week. ‘Premier mai’ is a time for giving and receiving lily-of-the-valley flowers here in France. I love these flowers, they have a heavenly scent and are so unassuming a plant that, for me, they just scream ‘chic’. 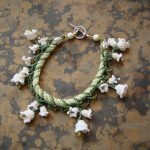 I made a brooch and a bracelet last year with lily-of-the-valley as the inspiration, but this year I’ve added to the collection with a quick make of a spring bracelet in luscious greens, a touch of pink and blue and some quiet bead which I’ve used as ‘dangler’ in this beaded charm bracelet. The bracelet is in the shop, and there is also a similar make but in autumn colours (not that I’m wishing the year away! ).